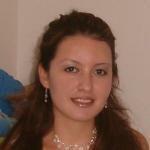 Nadine is an English language teacher with a specialized education and a great deal of work experience. She began working independently, using a communicative methodology, as an English teacher with individuals and groups. In 2012 and 2013, Nadine also worked as an educator with young children, giving English lessons through ludic activities. She now offers high-quality English lessons through Skype with the use of authentic materials.